We have fantastic litter of great Dane puppies. Date of birth 08.02.2018. Both parents are fantastic specimens of the breed _¼„? registered with supper temperament and very much loved members of the family. Pups are brought up in home environment with lots of socialisation with people other dogs and cats. Parents are from multi champion bloodlines. Health tested. Will leave home at 8 weeks microchiped we wormed and de flea, with 4 weeks insurance and royal canine bag if food. 1 black females left - 1200 3 harlequin boys -1500 sold 2 merle females- 1500 sold 1 merle boy-1200 - sold A non refundable 150 deposit secures a puppy of your choice. For more info or to arrange to view the puppies please call. Adopting, or buying a new puppy or dog is an important decision and big responsibility. As an owner, you will solely responsible for the welfare of your new pet and will also be financially committed. Before you decide to buy or adopt you must ensure that you’re 100% committed beforehand. For further information on caring for puppies and dogs, please visit our pet advice section. 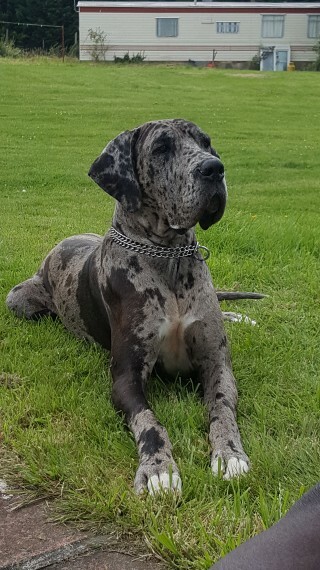 You can also find out more information about the Great Dane breed by visiting the Great Dane Dog Breed Information.